To musically entertain yourself with the Samsung Galaxy Note 3, kick off your shoes, find a comfy place to relax, put on a set of headphones, and fire up the Music app. You’ll find it on the Applications screen. Or, you could don your dancing booties and dance while you listen to tunes. Either way here is the Music app in Album view. If you don’t see any albums on your phone — or any music, for that matter you will need to acquire music for your phone. Songs: All songs stored in the phone are listed alphabetically. Playlists: Songs are presented according to playlists, which are groups of songs you create. Artists: Songs are listed by recording artist or group. Choose this category, and then choose an artist to see their albums. Choosing an album displays the songs for that album. Some artists may have only one song, not in any particular album. Folders: Getting nerdy, the songs are presented according to how they’re stored on the phone. Typically, that’s done by placing artists and albums into folders. 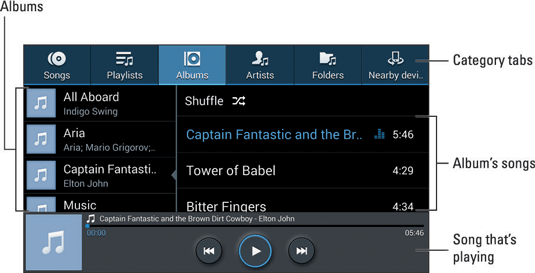 You may find two Music folders, for example — one for music saved to the phone’s internal storage and another for music on the MicroSD card. Nearby Devices: Songs are accessed via the local network and any actively broadcasting media-sharing devices. Touch a computer, game machine, or media device to access and listen to the songs available on that device. These categories (with the exception of Nearby Devices) are merely ways to organize the music — ways to make tunes easier to find when you may know an artist’s name but not an album title or when you may want to hear a song but you don’t know who recorded it. Any song that’s playing appears on the screen, as shown earlier. Use the onscreen controls to play, pause, or switch to another song. Album artwork generally appears on imported music as well as on music you purchase online. If an album has no artwork, it cannot be manually added or updated (at least, not by using the Music app).